A series of gigs by local artists played in galleries across Bradford are being screened exclusively in City Park. Bradford UNESCO City of Film worked in partnership with Bradford University to curate the gigs in unconventional performance spaces like the Bradford Industrial Museum. The result is five fascinating films featuring local artists like Angelo Palladino and Family Elan playing their music and talking about the venue. 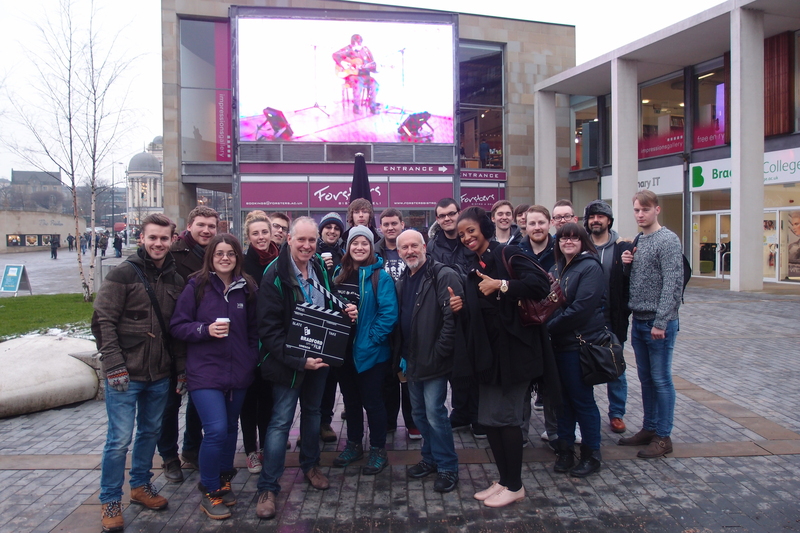 The films were launched today (Thu) on Bradford Big Screen with a special screening for the students who made the films. The performers and their venues are: Magpahi at Delius, Gerrard Bell-Fife at South Square, Angelo Palladino at the Peace Museum, Elizabeth at the Impressions Gallery and Family Elan at the Industrial Museum. Bradford Big Screen is a giant outdoor screen in the heart of one of England’s most vibrant and exciting cities with an international reputation for film and media.